Here’s a great expository writing project that might include a little research and provides lots of opportunity for creative presentation. 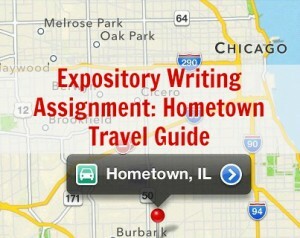 The assignment is to create a travel guide or brochure for your hometown. If you’ve lived in more than one place, you may choose for yourself which town or city you’d like to write about. You’ll want to include landmarks or places of interest that make your town or city interesting. If you don’t know the facts about these places, do some research on the internet or contact your chamber of commerce to get some information. Don’t stop with places to visit. Brainstorm some of the characteristics of your town. Is it quiet and peaceful, or busy and crowded? What are the best things about where you live? Remember, the idea here is to paint an appealing picture for people interested in coming to visit or live in your community. Don’t mention the terrible traffic, your mean neighbors, or the lack of exciting night life. Focus on the positives. Make your town as attractive and inviting as possible. In fact, feel free to exaggerate a bit if you like. When you’re ready to start drafting, begin with a strong introductory paragraph. The tone should be upbeat and welcoming. The body of your paper should be in order from most important to least important, so start with the most appealing aspects of your hometown. Don’t forget a concluding sentence that leaves the reader ready to book plane tickets! Since this is a writing assignment, the most important part of this project is the text of your brochure. But if you’d like to go all out, design the actual brochure, including images, charts, and fancy fonts. Be as creative as you like. You can do it all using a program on your computer, or you can do it by hand with paper, scissors, and colored markers. There’s no limit to how creative you can be with this one.